In 1990 I had the opportunity to spend three weeks in Turkey, travelling from Istanbul in the west to Diyarbakir in the East and down to Bodrum in the South. Through all this one of the more impressive sites was the blue hot water spring terraces of Pamukkale (pronounced Pa-moo-ka-le) in Denizli Province, in the south western part of the country. The brochures showed tourists flocking to bathe in the small pools that cascaded down the slope of a landscape that resembled a snow field—and this in the middle of July. These calcium carbonate deposits are what inspired the Romans to name the site ‘Pamukkale’, which means “Cotton Castle”. So when our bus tour actually arrived at the site, we immediately got into our swim gear, picked out the perfect pool to monopolize for our 30 minute stay, and proceeded to luxuriate in the warmth of the waters, all at the same time appreciating the surrealistic scenery, the crowds pouring off buses and waiting for their own ‘pool’ ,and the nearby hotel full of tourists enjoying the swimming pool, which featured ancient Roman columns from the nearby city of Hierapolis lying on the pool floor. I carried these memories with me for 20 years—actually up to November 27th, 2010– when I returned to Pamukkale to discover an empty landscape of dried-up white pools, no tourists, no nearby hotels and only a few guards yelling at shoe-clad unthinking tourists to get off the delicate travertine terraces. The influx of tourists and growth of hotels over the years had started a chain reaction of pollution and destruction. People using soap suds to bathe themselves, motorcyclists pretending to be Evil Kenevil tearing up and down the slopes, and the general wear and tear caused by disrespect for the terraces and the snow-like calcium deposits, started to turn the area yellow. Finally UNESCO stepped in and gradually a preservation plan was put into place. 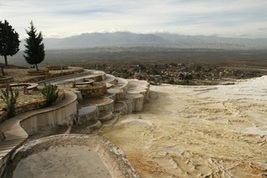 The water flow was diverted to prevent the further yellowing of the white mountainside. The hotels were demolished and the blue waters in the terraced pools dried up. Yet if you look on the internet or in brochures today, they still depict the Pamukkale of 20 years ago. People arrive, disappointed and perhaps even feeling a bit mislead. Pammukale has fallen victim to tourism, as so many other sites around the planet have. Whether it’s the carbon dioxide we exhale (which is destroying the Pyramid of Cheops in Egypt) or the hordes of tourists clamouring over Angkor Wat and the Bayon Temple twenty-four hours a day in Cambodia, or the ubiquitous plastic water bottles strewn around tourist sites throughout the world, tourism is proving to be very ambiguous. Countries need it to exist but the sites that attract tourists are being destroyed by the very tourists paying to see those sites. Pammukale, now off-limits to tourists, presents itself as a sad symbol of the disrespect toward nature that tourists, tour companies and countries eager to attract tourists, so enthusiastically promoted in the past, and alas in many cases, still promote today. The bottom line is that we are all thinking individuals (although some, more so than others) and respect for the planet, respect for attractions, respect for the environment must be an individual choice emanating from within ourselves. The call to action is really a question for every person who travels: What are you personally going to do to ensure that the very idea of travel does not become an exercise consisting of visiting one theme park after another, in which the great man-made and natural attractions of the planet are recreated in the spirit of showcasing them to a world in which they once thrived.